The heat is still on and I have been on a major need for chilled foods. Ohhh, ice cream how I want you. My darn Husband bought mint chocolate chip ice cream and I am home alone. That is a bad thing. Being left alone with ice cream in the house? Is that some kind of cruel joke? I could easily stand at the kitchen counter and take spoonfuls straight from the carton. But I’m strong, I don’t need to do that, instead I will feed my body with healthy ingredients that is just as refreshing and satisfying. I am very happy with today’s recipe because it is so perfect for hot weather, it’s filling and tastes amazing! I have for you my Berry Smoothie Bowl. 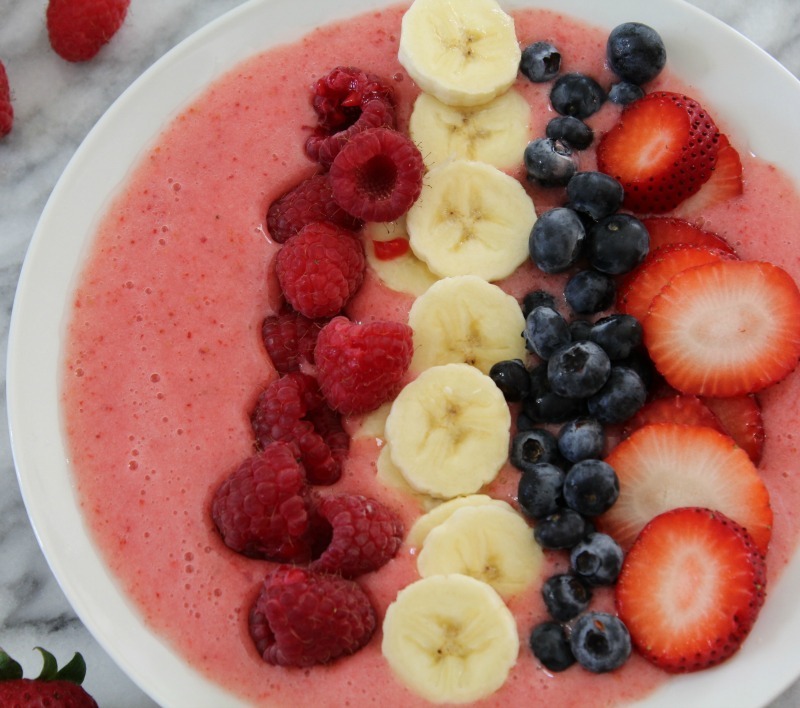 This smoothie bowl, is light refreshing and naturally sweet. 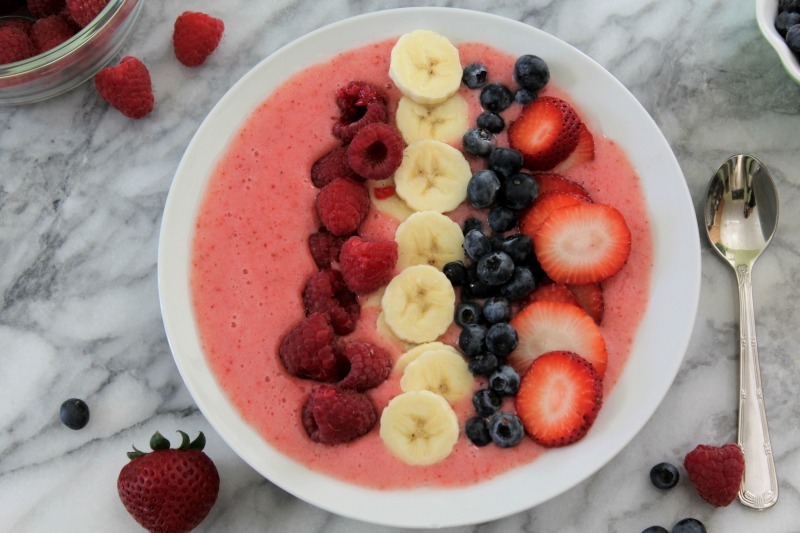 It’s made with frozen strawberries, a fresh banana and unsweetened coconut milk. Very simple ingredients. The smoothie has a nice strawberry flavor with just a hint of banana. I normally go with a frozen banana, but I used half of a fresh one. If you never had unsweetened coconut milk, it doesn’t have a coconut flavor, but to me it is a little thicker then skim milk and it’s also only 45 calories a cup. I topped my smoothie bowl with fresh blueberries, strawberries, and raspberries. I used the remaining banana on top. I don’t know what it is, but I really enjoy banana’s topped on my smoothie bowl. I actually have been craving banana’s for weeks. I never buy them though, because when I do, I forget I have them because they are in the cupboard. Out of site, out of mind. I think I have been craving them because I am lacking potassium. I have been getting awful Charley Horses in the middle of the night. That is the worse pain ever, well at least it seems that way at the time. So I had to have banana’s in my smoothie today. 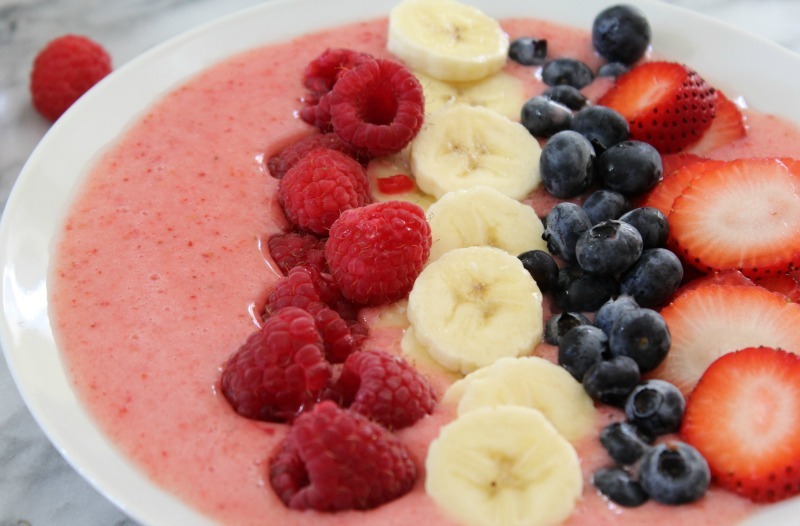 A light refreshing strawberry and banana smoothie topped with fresh berries and banana. In a blender, add frozen strawberries, ½ the banana and coconut milk. Blend until combined. Pour into a bowl. Cut remaining banana and top on smoothie, along with the strawberries, blueberries and raspberries. 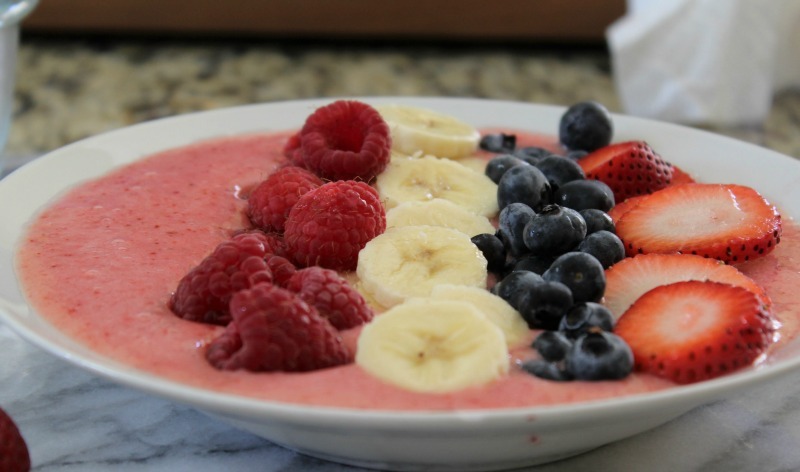 It seems smoothie bowls are one of the biggest raves right now. I can see why. You can fill your bowl with healthy good for you ingredients. Just top with what you like. I know I will be making more in the near future. Hi Ann, I like smoothie bowls, it’s fun to eat and more filling then just drinking a smoothie. 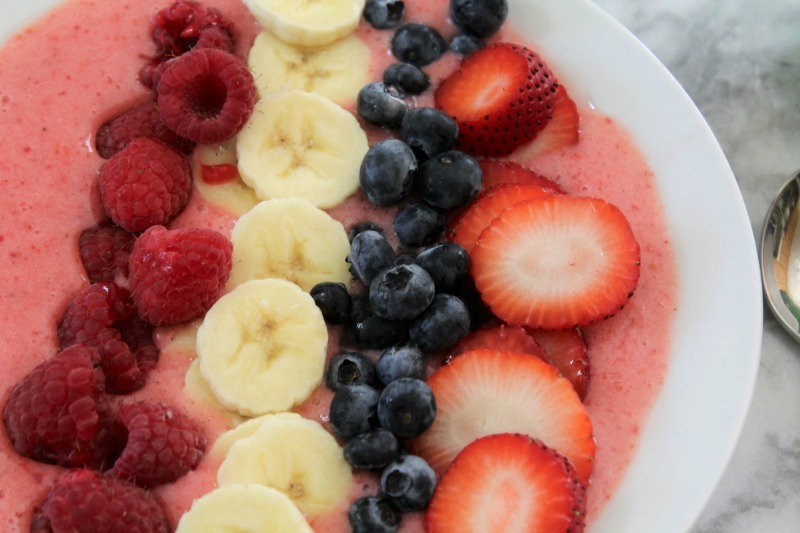 I super love this Berry Banana Bowl! thanks for sharing this.